Enterprise isn’t just about starting a business. It's about developing transferable skills that are valuable to any career, and seizing opportunities to gain experience outside of your degree. The Student Enterprise team gives students and graduates the support to develop practical skills and turn their ideas into a business or career. Whether they want to become entrepreneurs, freelancers or work for a company, students and graduates benefit from a range of support services. Subscribe to our email updates to keep up-to-date on our programmes, events, competitions, news and more. Successful entrepreneurs from across the UK share their experiences and top tips at our free workshops and events. 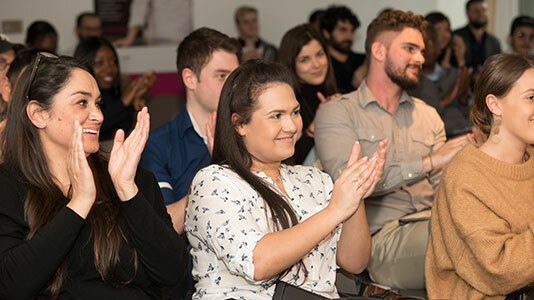 Students and graduates get the chance to find out what it’s like to be an entrepreneur, develop employability skills, network and enhance their CVs. Our sessions also help to build skills that are vital to any graduate's career or setting up a business. Get more information on our talks and workshops on the Student Enterprise events page. Get your Certificate and improve your CV! Certificates are accredited by the Higher Education Achievement Report Award. We run a range of start-up and business accelerator programmes for students and graduates who want to try out a business idea or develop an existing business. The schemes provide access to talks, workshops, networks of entrepreneurs and mentors, office space, and specialist legal and intellectual property advice. Spark is a 6-month programme exclusively for current students at LSBU who want to turn their ideas into a business while they study. Students get to test out their ideas and create a viable product or service. The programme includes up to £500 funding, mentoring, office space (hot desking), legal support and access to networks. If you're thinking of developing a business idea after you’ve graduated, our Graduate Entrepreneurship Scheme (GES) could be just the programme to support you. It is open to LSBU graduates (graduated in the last 5 years) who have a business idea they’ve validated and/or are at the early stages of running their business or social enterprise. Over the last 4 years we have supported 27 businesses on this programme to really grow their ideas. Find out more about the Graduate Entrepreneur Scheme. Competitions provide a great way for students and graduates to work in teams to develop their skills, practice pitching their ideas or gain access to funding for their business. We run a series of competitions and hackathons in partnership with different external organisations throughout the year, including: Universities Business Challenge, The Mayor’s Entrepreneur Competition and the London Higher – London Student Entrepreneur Competition. Email the Student Enterprise team for more information. We are eager to help students and recent alumni with finding financial help for their businesses and entrepreneurial ideas. Our offers include access to funding with our start-up schemes, and help with using crowdfunding. We also offer students and graduates opportunities to intern or work on consulting projects with local SMEs (small and medium enterprises) and start-ups. Internships with small companies allow graduates to see what it really takes to run a business and make an impact in a small team. Consultancy projects apply students’ academic knowledge in real-world scenarios and help solve real issues facing businesses. Whether it’s an idea, a design or a product, Intellectual Property (IP) is a valuable asset that can be licensed or sold to generate income. We offer 1-2-1 guidance, support and a series of workshops to help students get to grips with what IP is and how it can work for them.